When it comes to driving the Road to Hana on Maui, it's the journey, not the destination, that is the main attraction. 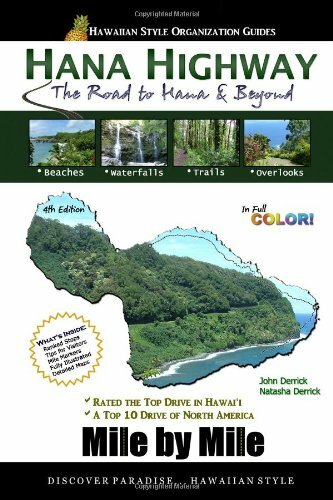 Let Hana Highway Mile by Mile: The Road to Hana & Beyond guide you along the 52 miles of undeveloped road, 56 one-lane bridges and 617 curves. You will pass by the most breath-taking scenery on the face of the earth. It was literally a million years in the making. And the journey doesn't end in Hana, it continues well beyond the sleepy coastal town at the bay. Husband and wife team John and Natasha Derrick are avid nature enthusiasts and researchers. John is a full-time webmaster who also enjoys study on many aspects of Hawaii, ranging from the cultural and historical to the flora and fauna of the islands. His partner in research and life, Natasha, is a journalist who discovered her love of the islands of Hawaii through John.